I must be a glutton for punishment, but here’s another challenge I first read about on Books of Mee. As I seem to gravitate towards books about women, for women and by women (comes with existential procrastination when I should be deep in the throes of literary creation) and have a collection of books which are appropriate, I thought, why not, bring it on! So Women Unbound: A Book Challenge, here I come. * Philogynist: read at least two books, including at least one nonfiction one. * Bluestocking: read at least five books, including at least two nonfiction ones. * Suffragette: read at least eight books, including at least three nonfiction ones. I think I’m going to opt for the Bluestocking challenge. 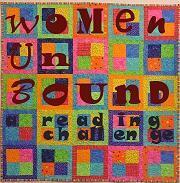 As the Women Unbound challenge runs from November 2009 – Nov 2010, I have plenty of time, and might even qualify as a Suffragette if I push the number of books to 8. Fizzy Thoughts and Paperback Reader have interesting lists if you want to join in and need some ideas for titles. I’ll finally get to read A Room of One’s Own, and Three Guineas by Virginia Woolf which has been on my bedside table for a year now… the shame. I’ll also be reading The Beauty Myth by Naomi Klein, To Live and to Write: Japanese Women Writers 1913-1938 edited by Yukiko Tanaka and my collection of Persephone books. For anyone looking for something Japanese and non-fiction, I highly recommend Modern Girls, Shining Stars, the Skies of Tokyo by Phyllis Birnbaum, a collection of vignettes featuring the lives of 5 writers, artists and actors in the early 20th century. Feminism means choice. As long as you think hard about your choices and make them yourself, you’re a splendid feminist. In order to do this, you need to be exposed to different cultures, ways of thought, education and people. If you want to be a housewife, go for it. If you want to go for a manicure and have matching shoes and bags, do so. As long as it’s your decision, that’s good enough for me. It doesn’t make you a less serious person. Yes I do. I think if you are a woman, you are a feminist. Whether you are fighting against the glass ceiling/chauvinism in the workplace, home or society, a fight is a fight. Besides, we can’t seem to get away from it. I think one of the biggest obstacles is our sense of worth. Why do we feel that we aren’t as valuable or entitled as men? That our opinions, thoughts and the work we do don’t have the same gravitas? If we can’t take ourselves seriously, then men certainly won’t. Germaine Greer once said that we cannot have true equality unless we tear down the society we live in and reconstruct a totally new one, that our society is fundamentally geared towards and created for men, and I’m inclined to agree. Thanks for the link! I plan on rereading A Room of One’s Own during the challenge. I love your meme answers. I agree that feminism is about choice and about the availability of choice. I think it also about respecting the choices of others, whether we agree with the choice or not we still defend their right to make it. Nicely put! Especially about respecting the choice of others! Great responses! I don’t know if I think society should be completely torn down and reconstructed (Well, at least, I don’t think it’s possible to do), but I definitely think it’s true that there’s a lot of preconceptions holding true equality back. I know, but you live in hope that things will really change. Great challenge, and always very topical! Feminism means choice for me too. You said it better than I would’ve :). There are a couple of Japanese non-fiction that I’m thinking to read, but I can’t decide on one yet. I just heard of Modern Girls, Shining Stars. It’s pretty obscure book, isn’t it? A quick amazon search showed that it costs $83.50! OMG! That’s so pricey! I got it several years ago when I was working at a Japanese bookshop. You might want to check out The Book Depository which has it at a more decent price with free worldwide delivery ^^. i remember the first book i happened to read on “feminism” was about Mary Wollstonecraft (世紀末ロンドンを翔んだ女—メアリ・ウォルストンクラフトを追う旅), probably when i was 18or19, only for its title cos i was searching for anything related to London at that time. soon after that i chose my tutor who was a Virginia Woolf researcher. the most fascinating was to learn how vw tried to create a voice of her own, a narrative that crosses the borders of the narrator/characters as well as consciousness/unconsciousness. a voice challenging the limits/structure of our language (structure = masculine). btw, this just reminded me of classic japanese writing where male authors used chinese characters whereas female authors used only japanese alphabets(hiragana). interesting if you can see the difference – jp alphabets being soft and free from structure. as of japanese writing, this is the title that crossed my mind if you haven’t read it yet. “The Woman in The Dunes”(砂の女) by Kobo Abe. i have to say that i’m very lucky that i live in a time and society where i am free to choose how to live and to express myself, with my own responsibility of course. Nice Eriko! I must check out Kobo Abe. He’s also one of the writers (together with Oe and Mishima) who have been rattling around in my reading consciousness for a long time but whom I haven’t had the chance to read yet. It’s very interesting what you’ve said about the connection between language structure and gender. I was aware of words denoting the masculine/feminine nature of the language but never realised that the structure of the Japanese characters themselves were divided along those lines. Very interesting about women and hiragana! And your comment about Virginia Woolf is fascinating. I never thought of challenging the structure/limits of the English language as challenging the masculine nature, although you can’t but be aware of how the words within the language demarcate the relative positions of men and women within society. My knowledge of gender studies is very poor, so this might be a good chance for me to start reading around the subject! do let me know about your new findings..
another impressive title along this theme for me is Margaret Atwood’s “The Handmaid’s Tales”. female writing is still an intriguing theme for me. I will. I enjoyed Atwood’s novel, although it was rather disturbing. I see what you mean about the novella about the housewife…you don’t really want to think too deeply about it if it begins to colour your perception of your world. In a way, you need to gauge your personal happiness against that of the world and the people around you. To keep you grounded. Otherwise you end up too tightly bound within your own world. I like reading female writing precisely because it gives me an insight to other women and their struggles and also to see why I think and feel in a certain way, whether it is just me or whether I’m one amongst many. I think we never stop learning though, however much we read and talk. The book that Eriko mentions – I wonder if it will be mentioned again on anyone else’s list? It almost reminds me of Kate Chopin’s The Awakening. Also, isn’t everyone’s defn of feminism interesting? How one word can be so charged and interpreted into so many levels and nuances and emotions. I’m really excited about this challenge. It’s a pleasure to join this challenge and as I’ve been thinking a lot about these issues for a while, it’s great that I’m finally going to start reading some of the books I’ve been collecting! I’m also excited about thinking and writing about the books in the context of this challenge and maybe comparing them to some of the other reviews by the other bloggers. « Keyboards at the ready, it’s Nano time!